My criteria for my next camera bag was something that could comfortably hold my Nikon D810 with the 70-200mm f/2.8 lens attached, some extra lenses, definitely my tripod and leveling head, and possibly another camera body. A bonus would be if the bag had some spare room to carry my 15″ MacBook Pro Retina so I could use it as my travel solution when flying as well. 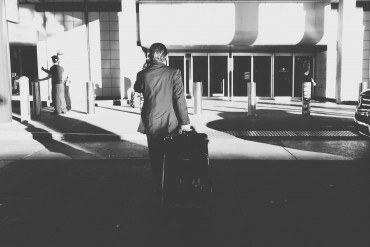 To make things even more difficult, I wanted a bag that looked good and wasn’t too large to slide under the seat on an airplane (I’m not a fan of checking luggage and rolling the dice to see if it actually landed in the same state or country as I did). So to sum it all up, I wanted a bag that was manageable in size, versatile, durable, and fashionable. The first thing you’ll notice when you pick up this bag is its rigid build. It’s not a soft bag that folds in on itself when you pull your gear out. 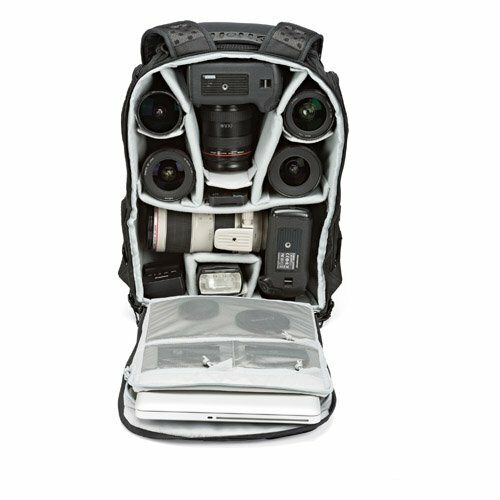 The bag remains rigid so you can slide your camera back in without having to take the bag off of your back and lay it down. You’ll appreciate this next time you are photographing from the top of a parking garage where it looks like a car just puked up all of its oil onto the cement and you’d rather not repaint the bottom of your shiny new bag which in turn will repaint the upholstery in your car on the way home (and then subsequently get kicked out of said parking garage because it’s frowned upon to take photographs from the parking garages in Pittsburgh). Through the workshops I've held, I've discovered that the reason many photographers don't have the equipment they'd like with them when they'd like it is simply because they have not found a good way to carry it. One of the primary downsides of using a backpack to carry your gear around is that every time you want to grab your camera you’ve got to take the bag off of your back, set it down, and then try to fish your arms back through the bags straps whilst holding your camera. Not so with the Lowepro (like my Dr. Seuss like rhymes? ), there are two zipper pockets on each site of the bottom of the bag so you can simply pull one arm out of the strap and shift the bag to the opposite side to open the pack and pull out your camera. 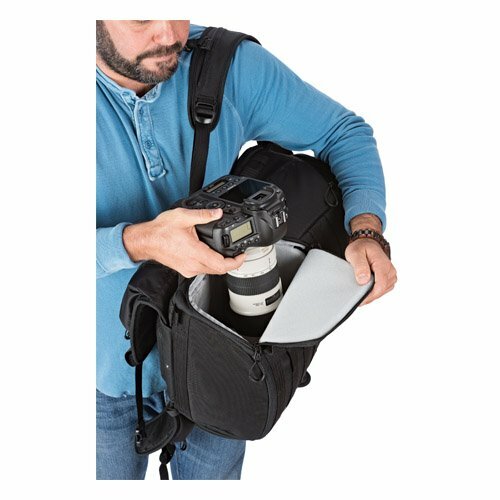 This is one of the best solutions to quickly accessing your gear that I’ve seen implemented in a camera backpack to date. Accessing your gear couldn’t be easier or have more variety than with the ProTactic 450, there are 4 different ways to access your precious kit. You can lay the pack down and unzip the entire back to open the bag like a surgeon. You can open the top of the bag to pull a camera out like Excalibur from a stone. Or you could use either of the bottom side pockets to pull your camera(s) out quicker than a Wyatt Earp laying down the law. Honestly, I could not think of another way to get at your gear without a magic spell. The material the bag is made from is thick, the zippers are heavy-duty, and the straps are well-built. Speaking of the straps, the idea to include multiple nylon straps to attach gear to is genius. The setup of the bag (tripod location, included accessory pouch, and water bottle holder) is able to be customized to each photographers desires. If ever there was a bag developed by photographers for photographers this is it. The first thing I did when I received the bag was to remove the waist belt because I’m currently using it for urban photography and I felt it made the bag look intimidating to strangers (I do a lot of street photography and it pays to be incognito). The waist belt is extremely difficult to pull out, Lowepro uses Velcro to affix it but the area where it’s affixed is extremely tight and impossible to peel the Velcro off… You’ve got to use one hand to push through and separate the tiny latches in the Velcro and then pull hard. When I was finished my knuckles were chewed up from the Velcro. The only quibble I have with the layout of the bag is that I wish the shoulder straps had small pockets on them. The waist belt I removed has nice sized zipper pockets on it but I don’t see myself using that strap unless I’m hiking in the back-country… Not something that would stop me from saying this is my favorite bag I’ve reviewed to date. Traditionally, I have had a camera bag for various situations. None of my camera bags have a great solution for a tripod and none of them are expandable to the point where I feel like I could use them for any job. The Lowepro ProTactic is the only bag I’ve owned* where I can comfortably tackle any job that comes my way without moving all of my gear from bag to bag or carrying a separate tripod bag. I’ll probably still use the Pelican hard-case for structured shoots (on site at client’s business) but for anything else, things where I know I’ll need to cover some ground, I’ll be using the Lowepro backpack. The reason is that although the backpack would be fine for use on site with clients I believe the hard case looks a little more professional and packs a little more gear. I also like to use the hard-case as an impromptu desk for my laptop or tablet… Something I would never do if I were working in the city (because of theft). I’m going to keep this short and sweet. This bag is worth every dollar you’ll pay for it. The bag is versatile enough that it will save you from having to purchase multiple bags and built well enough that you may not need another bag for many years. If you’re looking for a bag that is well-built, functional, and versatile then I’d say this is the bag for you. I’ve been using the bag for over a month and have zero complaints. I especially like that I can now carry my tripod without having to carry a separate bag or squeeze it under the flap of my ONA bag… Half of the time I would talk myself out of taking the tripod with me because of the inconvenience of carrying it separately. 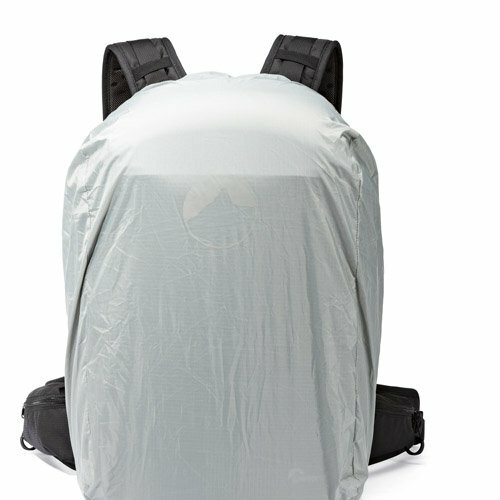 The bag is very low-key, at first glance it won’t look like you’re hauling around $10k worth of camera gear. Though, it is a dead giveaway if you have your tripod attached to the side of you bag like in the image above. If you’re a street photographer you likely won’t have a tripod with you so you’ll appreciate the low profile look of the bag. I can comfortably say this is the best bag I’ve reviewed to date. Feel free to leave your thoughts or let us know what your favorite camera bag is in the comments section below. Thanks for a helpful, informative review AND for a few chuckles along the way! I have to agree with this review. I’ve owned mine for about 8 months now, and it’s traveled internationally with me on several trips. Even with the full sized tripod attached to the side, it fits in the overhead compartment of every flight I’ve been on, and in many cases also under the seat in front of me. (Like John says above, thank god they don’t weight it!) I’m a 5ft2″ female, with a 37lb fully loaded bag on my back. It holds both my full frame and crop sensor cameras, a 100-400mm, 70-200mm, 24-105mm, 100mm and 16-35mm lens, plus my Lee filter kits, flash and small accessories. The hard top lid has a small zipper compartment, which I use to hold my gloves, a light snacks and my cell phone. With the padded shoulder and waist straps, and the sliding adjustable chest strap, this is hands down my favorite gear bag (and I have 3 others from other companies at home, collecting dust now). The addition of a soft sided water bottle holder is also nice, as I tend to carry a small thermos with me, for those early morning/late evening shoots where some hot coffee helps take the edge off. Even on my small frame, this is a comfortable backpack, and it holds pretty much everything, plus the kitchen sink! Hey! Thanks for sharing sharing your thoughts. I couldn’t ask for a better professional bag. Take care! 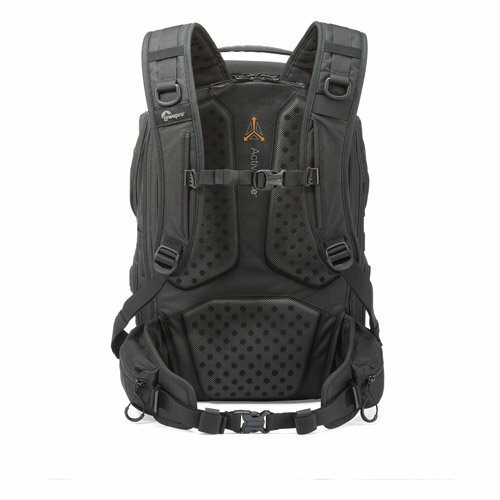 It seems to me that the straps are not padded … With the backpack full and heavy… Does not it become uncomfortable on the shoulders? thanks! 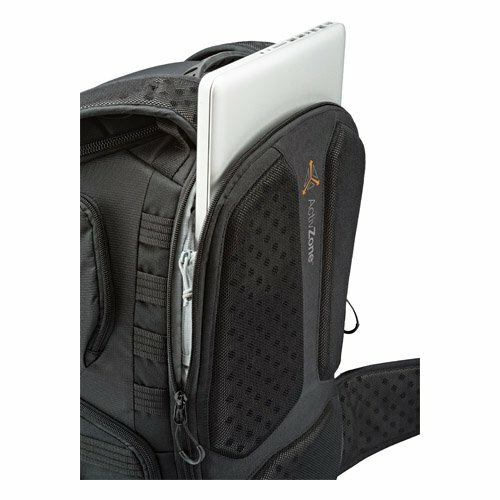 The straps are padded and it has a hip pad as well which takes the weight off your shoulders. Very comfortable. yesterday I was in a store and they let me try it on with all my stuff. The space is amazing, fantastic! But the straps… On the back it is comfortable but on the shoulders it is not so comfortable. The straps are thin and lightly padded. 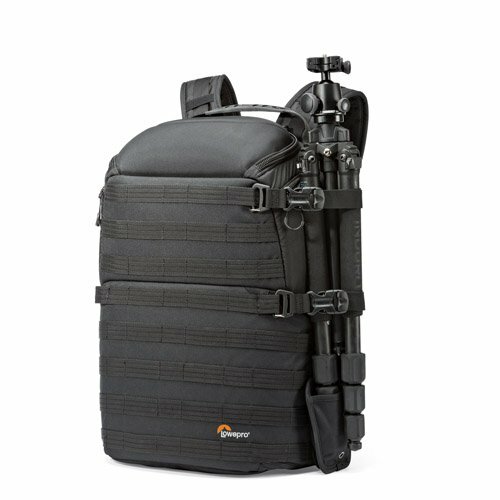 In the store there was also a Lowepro Pro Runner 450 that has the much more padded shoulder straps and much more comfortably on the shoulders. It is easy to compare the straps of both backpacks, and see the volume difference, the difference of the padded area.